Making a quantum computer - a difficult process that requires a holistic approach to solving a variety of problems. And one of the major problems is the need to use expensive exotic materials to create the same exotic electronic circuits.Fortunately, a team of engineers from the University of New South Wales was able to create the world's first quantum logic gate based on the traditional silicon. 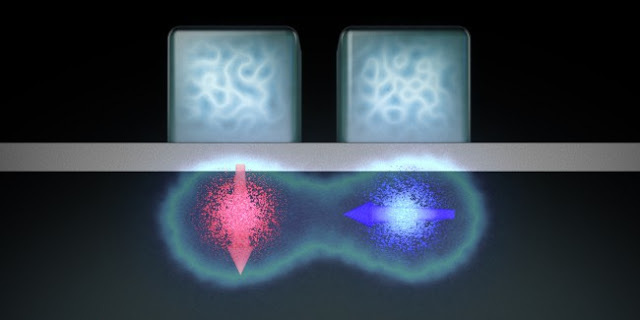 Engineers have created a device that allows two quantum bits (qubits) to communicate with each other. Due to the fact that the logic gate is based on silicon, the creation of the quantum computer has become closer to reality. In the conventional electronic computer (either a PC, a tablet or a smartphone) information is stored in a bits having the value of 0 and 1. In the quantum computer is capable of qubits in state (or, in other words, have a value) and 0 and 1 in one and the same time. 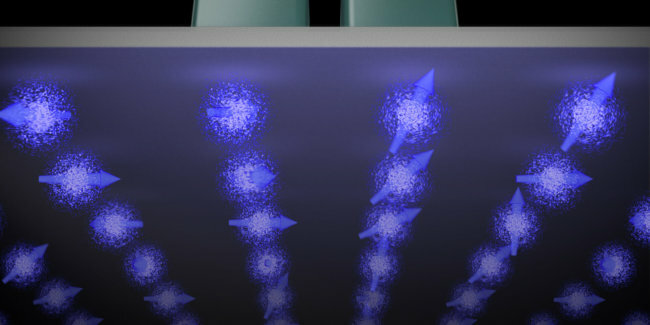 This ability qubits in theory allow quantum computers much faster to conduct multiple, simultaneous and parallel computing. The problem is that the full quantum computer have to operate not just one qubit taken separately, and to teach these qubits to communicate with each other. This two-bit process can be used to create logic gates - the basic elements of a digital circuit, performing elementary logic operation. Quantum logic gates Scientists have already created. However, their establishment required the use of exotic materials. Previously, it was "proven" that create a quantum logic gate based on silicon would be impossible. "Quantum logic state is encoded in the back of a single electron," - explains Andrew Dzhurak, head of the new research. "The main problem is how to create a logical link between the two electron-spin qubits, since the electrons need to be separated by a very short distance (about 20-40 nm), and thus we need the ability to manage such electrons. It has been proven that in view of the scale too small to achieve this is almost impossible or at least very, very difficult. " To decide whether a new team of researchers decided to borrow some concepts of existing transistors and achieved the interaction between qubits are based on silicon. They took the transistors are not very different from those used in our computers and smartphones, reconfigure them so that one of the transistors has only one associated electronic. Since the state of a quantum bit can be determined by the spin of a single electron, the process is transformed each transistor in a single qubit. In the article published in the journal Nature, a team of researchers said that they can use the metal electrodes on the transistors to control the qubits and their interaction with each other. "A key breakthrough was the discovery that we can independently access each qubit separately by normal changes in the voltage applied to the metal gate over it," - explains Dzhurak. "It really simplifies our task of working with quantum logic Gate." The creation of such quantum circuits based on silicon is a really important achievement, because the computer world is actively using this material. A team of scientists said that as their approach generally uses existing technology, you can create a full-sized quantum chip was much faster. Although the task will still be difficult. "It takes a lot of engineering work to develop the topology of connections required for read and write operations thousands or even millions CMOS-qubit" - explains Dzhurak. "Since our work is built on borrowing many aspects of design CMOS-chips, we need to reorganize these aspects in cooperation with the manufacturers and developers of these CMOS-chip." "With a sufficient level of investment in 5 years we will have chips with dozens or even hundreds of them contained in CMOS-qubit" - says Dzhurak.